Even when only 20% of the elder population in the world receives pension coverage (Pallares-Miralles, Romero and Whitehouse, 2012) which in addition is not always adequate according to ILO, non-contributory pensions are present only in a handful of developing countries. Moreover, the elderly population is currently growing as individuals tend to live longer, what further evidences the imperative need to apply this type of programs. Costa Rica implemented a non-contributory pension policy in 1975 to ensure the livelihood of those in economic need that were not able to save provisionary funds to confront the old age risks, so that elders aged above 65 living in extreme poverty are eligible for coverage. Additionally, Costa Rica adopted a 186% increase on the pension amount in 2007 in order to mitigate poverty. This study aims to provide further empirical evidence of the indirect effects of the non-contributory pensions in Latin America, through a study case for Costa Rica that explores the impact of this pension on employment and schooling, household composition, and changes in well-being for the period from 2001 to 2009. The methodology applied includes a first difference-in-differences specification (DD) as a general model, which compares the group of receivers before and after 2007 with a control group aged above 65 years old. Secondly, we exploit the discontinuity on the treatment assignment regarding the age of the oldest household member to define a Regression Discontinuity Fuzzy Design (RD). This local analysis only identifies the effects of receiving the pension, so that we move towards a third Difference in Discontinuity Design (diff-in-disc) that combines the previous models, quantifying the impacts of the pension increase as well. The RD and diff-in-disc settings include an alternative sample where the treated are households with a member between 65 and 69 years, while the counterpart is aged between 61 and 64. Our results show a generally positive picture of the Costa Rican non-contributory pension, if we consider that the policy was designed to provide an allowance to elder that never contributed to the formal system, allowing them to retire at age 65. However, conditional income transfers sometimes involve unintended consequences that characterize the policy as defective. In the case of the DD sample, where the family structures are characterized by households with senior members and households where the recipient is father or mother of the household head, the results show major spillover effects on the remaining members, especially in terms of labor- related reactions. Indeed, the estimations show that those households that benefit from the non- contributory pension reduce significantly by 0.179 the number of individuals in the labor force, compared to non-beneficiaries. Individuals in the treated households work 1.747 hours less than their counterparts and receive a labor income 61.9 USD lower than those households that do not receive the pension. Given that the Costa Rican non-contributory pension policy requires leaving the labor market as a necessary condition for receiving the grant, we might relate the reduction in labor participation to perverse incentives, as the remaining household members might take advantage of this transfer to change their time allocation preferences between work and leisure. Nonetheless, the results obtained in the RD and diff-in-diff models rule out our preliminary interpretation. Both estimates reveal no significant reactions at the household level for any of the outcomes analyzed, what means that households do not change their employment-related decisions in the short-run, even when the recipient must leave the labor market. In this case, the households with senior members predominate over other type of family structures, hence we would have expected a significant decreasing effect for labor force participation. Probably this is because unemployment and job instability hit the most vulnerable population groups, so that individuals with uncertain job prospects see in the non-contributory pension an opportunity to receive a steady income. Moreover, we do not find evidence neither for the incentive for other young members of the family to move in with the elderly participant, nor for the recipient to move out and live on her own. Francesco Amodio ’10 (Economics) co-authored this article for VoxDev with Barcelona GSE Research Professor Giacomo De Giorgi along with World Bank economists Jieun Choi and Aminur Rahman. In the article, the team gives an overview of a field experiment they conducted and theoretical model they developed that describes the interaction between firms and inspectors. They found that anonymous rating of inspectors can decrease bribes and increase tax revenues as long as it takes into account market structure considerations. There exists a substantial body of literature concerned with the calibration of the Heston model for pricing financial derivatives under stochastic volatility, many of which rely on computationally expensive algorithms. Our paper evaluates a calibration method of the Heston model proposed by Alòs, De Santiago, and Vives (2015), which can be used to price derivatives with little computational effort. The calibration method is innovative in the sense that it considers only the three most critical regions of the implied volatility surface. The regions where the underlying option is, firstly, at-the-money, secondly, close to maturity and lastly, far away from maturity. Although their procedure is parsimonious and very easy to implement, they calibrate a model whose empirical applicability is contested. 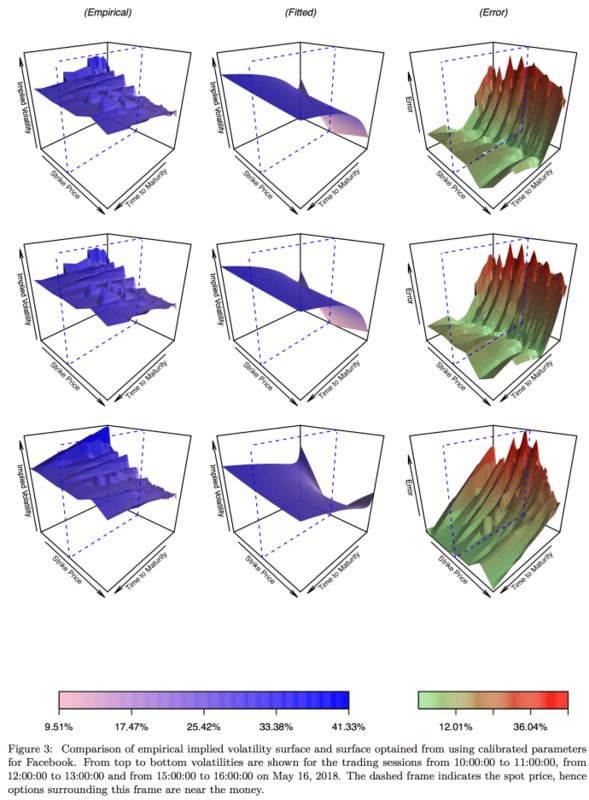 The main contribution of our paper is the evaluation of their model in an extensive numerical exercise as well as an application to real data. Collecting empirical option data has been one of the main challenges with respect to this work, since historical data on financial derivatives is not accessible to the public. Faced with this issue we have written a script that allowed us to automatically scrape option data at a high frequency over just a couple of weeks. Thus, we build our own extensive data base. Also, we have made the data and code available on https://griipen.shinyapps.io/bgse/ and https://github.com/HitKnit/BGSE2018/tree/HitKnit-optionscraping, respectively. In terms of our results, we find that whilst the calibration method has solid theoretical foundations and produces satisfactory estimation results within the theoretical Heston universe. However, it fails in practice. Specifically, for the numerical exercise we find that out of all simulations the maximum average error across the entire volatility surface is 0.999 percent while the mean error across simulations is only 0.481 percent. In sharp contrast to that, absolute percentage errors for our empirical data are on the order of 30-40 percent in many cases. In the following figure, we present our findings for intra-daily data from May 16, 2018. The left column shows empirical implied volatilities for a European call option on Facebook Inc. (FB) stocks. From top to bottom volatilities are shown for the opening, lunch and closing sessions. The central column shows the fitted volatility surfaces while the right column shows absolute percentage differences between empirical and estimated values. The finding that errors are particularly high for at-the-money options with short times to maturity is robust across the entire data sample. In light of these results, we conclude that inherent limitations of the Heston Model disqualify the calibration for practical use. Nonetheless, we believe that similarly simple calibration methods as the one examined here should be used in combination with more sophisticated option pricing models. Alòs, Elisa, Rafael De Santiago, and Josep Vives. 2015. “Calibration of Stochastic Volatility Models via Second-Order Approximation: The Heston Case.” International Journal of Theoretical and Applied Finance 18 (06). World Scientific: 1550036. Brian Albrecht is a PhD candidate at the University of Minnesota and a graduate of the Barcelona GSE Master’s Program in Economics of Public Policy, as well as a past editor of the Barcelona GSE Voice. He is also a contributor to the Sound Money Project, a blog from the American Institute for Economic Research (AIER). He writes regularly for the site, so be sure to check out his previous work there as well! Our paper analyzes the impact of a cash transfer program targeting households in extreme poverty in Uruguay, called the Tarjeta Uruguay Social (henceforth referred to as TUS). In the past decades, cash transfers have become one of the main social assistance policies used to address poverty and inequality in developing countries. Their objective is to reduce vulnerability by increasing and smoothing household income, although additional objectives are usually defined depending on the program and country, such as increasing access to health and education, and reducing food insecurity (DFID 2011; Honorati et al. 2015). The impact of these programs on different life outcomes has been widely studied. Overall, positive impacts on poverty, food insecurity, child school enrollment, labor outcomes, health and social cohesion have been found (DFID 2011; ODI 2016). Nevertheless, more research is still needed to understand the channels and particular aspects that determine their success, since countries differ widely in the details of program design. In our research, by taking advantage of considerable design modifications since the implementation of TUS, we evaluate the impact of the amount of the transfer and the benefit duration on relevant outcomes. The Tarjeta Uruguay Social (TUS) is a conditional cash transfer program implemented in 2009 which aims at assisting those in situations of extreme poverty in Uruguay. It targets the 60,000 worst-off households by providing them with a monthly cash transfer on a prepaid magnetic card. This card can be used to purchase food items, cleaning supplies, and hygiene products, excluding cigarettes and alcohol. Eligibility for the program is based on the Critical Needs Index (CNI), a proxy means test that evaluates household poverty, using variables associated to education, dwelling, access to durable goods and household composition. The program has undergone many modifications since its inception, including increasing the number of participants, changing the eligibility criteria, and a doubling of the benefit for half of the recipients. Our analysis begins in 2013, in which the program had 60,000 participants, and the poorest 30,000 according to the CNI received a doubling of their benefit, creating two benefit categories: Simple TUS and Double TUS. In our research, we exploit the doubling of the benefit based on the CNI by using a Fuzzy Regression Discontinuity Design to evaluate the impact of the amount of the benefit on life outcomes. The availability of an extensive set of administrative data allowed us to evaluate the impact of the doubling on an array of outcomes. There are many different channels through which this cash transfer program could have positive effects, since the resources freed up by the relaxation of the household budget constraint could be used differently according to household preferences. Therefore, by taking advantage of a rich set of administrative data, we analyzed 65 outcomes: housing and living conditions, food insecurity, formal labor market work, education enrollment of children and adolescents, prenatal and birth health conditions, and family composition. Additionally, we analyze how the duration of the benefit affects the impact of the program by comparing the effects for beneficiaries who receive the transfer for different time periods. We analyze short-term outcomes for those who receive the transfer for less than a year; medium-term outcomes for those who receive the transfer for two to three years; and long-term outcomes for those who receive the transfer consistently for three years. Probability of Receiving Double TUS According to Distance from Eligibility Threshold by Month, 2013. Analysis begins in May 2013. Our results show than an increase in the amount of a cash transfer can in fact have important impacts on the life outcomes of recipients. Positive effects were found with regard to living conditions, with an increase in investment in durable goods and a betterment of housing conditions, such as purchasing water heaters or washing machines, adding a bathroom to the home, and upgrading from a trash roof to a concrete one. Additionally, results show positive impacts concerning individual outcomes, with improvements regarding prenatal care and months of formal work observed. Nevertheless, some negative results were found in the short-term, which could potentially be explained by an attempt of manipulation by the beneficiaries in order to ensure continued benefit provision under uncertainty. Results also show that the duration of the benefit has a considerable impact on how the transfer is spent. More positive significant household results are found in the medium-term, while individual results become stronger in the long-term. The increasing effects of more persistent benefits could potentially be explained due to uncertainty in the short-term regarding whether the benefit will continue to be provided, which decreases over time. This study contributes to the literature of poverty alleviation policies by providing evidence which can be used to improve the design of cash transfer programs. The positive effects found in this paper from comparing different amounts of the transfer within the same program indicate that the monetary amount of the benefit is a relevant policy parameter with consequences for the effectiveness of the program. Additionally, the results for heterogeneous effects by benefit duration indicate that the persistence of the transfer is another relevant aspect of program design. The evidence provided in this paper indicates that a predefined duration upon entering the program together with a minimum duration of one year could constitute a good practice. This may mitigate negative effects regarding household manipulation attempts and potentiate positive effects by reducing income volatility and increasing housing investments. Our results suggest that further research on benefit size and timing is imperative for policy design of cash transfers, one of the main tools to reach universal social protection. 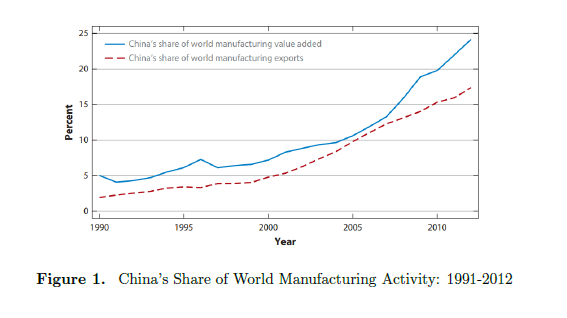 The goal of this paper is to assess quantitatively the impact that the emergence of China in the international markets during the 1990s had on the U.S. economy (i.e. the so-called China Shock). To do so, I build a model with two sectors producing two final goods, each of them using as the only input of production an intermediate good specific to each sector. Final goods are produced in a perfectly competitive environment. The intermediate goods are produced in a frictional environment with labor as the only input. First I calibrate the close economy model to match some salient stylized facts from the 1980s in the U.S. Then to assess the China Shock I introduce a new country (China) in the international scene. I proceed with two calibration strategies: (i) calibrate China such that it matches the variation in the price of imports relative to the price of exports for the U.S. between the average of the 1980s and the average of 2005-2007, (ii) Calibrate China such that variation in allocations are close to the ones observed in data, for the same window of time. I found that under calibration (i) the China Shock in the model explains 26.38% of the variation in the share of employment in the manufacturing sector, 16.28% of the variation in the share of manufacturing production and 27.40% of the variation in the share of wages of the manufacturing sector. Finally, under calibration (ii) I found that the change in relative price needed to match between 80 to 90 percent of the variation in allocations is around 3.47 times the one observed in data. According to the model, the China Shock explains 26.35% of the variation in the share of manufacture employment, 16.28% of the variation in the share of manufacturing production and 27.44% of the variation in the share of wages of the manufacturing sector. The first of these results is consistent with findings in Autor et al. (2013). On the other hand, the variation in the unemployment rate of the economy is not matched, neither for the first nor the second calibration of the open economy. I also found that as a consequence of the China Shock, real wages increase when measuring them in terms of the price of the import good, and decrease when measured in terms of the price of the export good. This result is not in line with findings in Autor et al. (2013). The optimal unemployment insurance in the open economy is 6.13% of average wages higher than in the close economy because the unemployment rate of the open economy is higher than in the close economy (0.9% difference). Finally, the model generates a non-traditional source of comparative advantage, arising from differences in the relative bargaining power of workers. We capitalise on the 2006 implementation of a minimum wage for the hospitality sector to make well-evidenced inferences about the impact of the upcoming National Minimum Wage (NMW) Legislation on low-wage workers. Our paper focuses on the two largest low-wage sectors currently without minimum wage regulation, which are manufacturing and construction. Two regression specifications and sensitivity analysis are used to provide insights into the implication for wages, hours worked, employment, formality and poverty rates. In light of our results and a comprehensive review of the literature, we conclude that the NMW will be largely beneficial for low-wage labourers. Our critical recommendation for policymakers is the need for complementary policies to ensure compliance and facilitate the transition of vulnerable groups (particularly black women) into the formal sector. From our first specification, our analysis suggests that wages and hours worked will increase in manufacturing and construction sectors as a result of the minimum wage, mostly driven by increases for black and female workers. Although the policy is likely to increase the formality rate among male workers, we predict formality will fall among females as employers try to circumvent the legislation. Therefore it is crucial that adequate complementary policies are implemented to ensure the benefits are captured by all population groups. Our second specification exploits the variation in the median wage across provinces. In doing so, we find no significant effect on wages, which signals regional impacts of the minimum wage are fairly homogeneous. Therefore, compared to other countries adopting a similar policy, the implementation of safety-nets combating the adverse effects of the minimum wage will be relatively more straightforward. By conducting sensitivity analysis around compliance rates and poverty lines already stipulated in the literature, we predict between 100,000 and 300,000 manufacturing and construction workers will be lifted out of wage poverty as a result of the minimum wage. We combine our empirical partial equilibrium analysis with theoretical general equilibrium forces to provide statements on the anticipated lower bound of wage changes. Economics alum Aishwarya Deshpande ’18 has written an article for Behavioral Scientist magazine. In honor of Nobel Laureate Richard Thaler’s famous book Nudge turning 10, Aishwarya Deshpande (Economics ’18) writes in Behavioral Scientist magazine about the emerging subfield in development economics, namely behavioral development economics. The subfield aims to incorporate insights informed by behavioral science to address issues of persistent inequality, poverty alleviation and welfare. Aishwarya had the pleasure of reading various academic papers that addressed these issues with innovative approaches in preparation for the essay. She finds that ‘last mile’ between intention and action can be bridged by understanding the limitations of the human mind, which potentially has many policymaking implications.